I could not find any flaws. One can get confused with stand and taxiway markings on asphalt. I think I may not be the only one – this is why airports have follow-me cars and marshallers. The solution seems to be a simple one – paint the markings of aircraft parking in a larger font – they will be more visible, wouldn’t they? In Denmark, stand markings are probably the biggest in the world. They are huge! Taxiing here is even easier (although the apron is not of particularly complicated design). The organization of taxiways is also a good compromise between cost and needs. Two hardened taxiways connect apron with the runway so that there will be no conflict between the plane preparing to line up and the one that has landed. To shorten runway occupancy general aviation aircraft can use a grassy taxiway connecting to runway further east. In the scenery, as in reality, we recognize it by white-blue traffic cones that mark its limits. The grassy glider runway extends east from this taxiway parallel to the main runway. In the scenery, as in reality, it remains unmarked – only the trimmed grass shows the correct spot for landing. Not that there is a need for anything more. I remember flying (IRL) a glider in Samedan (Switzerland). 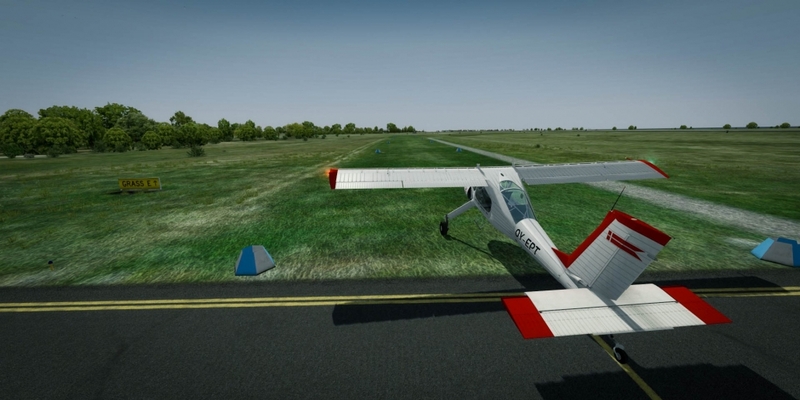 All the grass between the runway and taxiways was available for gliders. The number of planes on the general aviation parking can attest to the popularity of Bornholm among general aviation pilots. The 20 miles that divide Bornholm from the Swedish coast is a distance that should not stop even a prudent pilot of a single-engine plane. More courageous (or more confident in the efficiency of their planes) will challenge their aircraft on the way to Germany and Poland (50-60 miles). 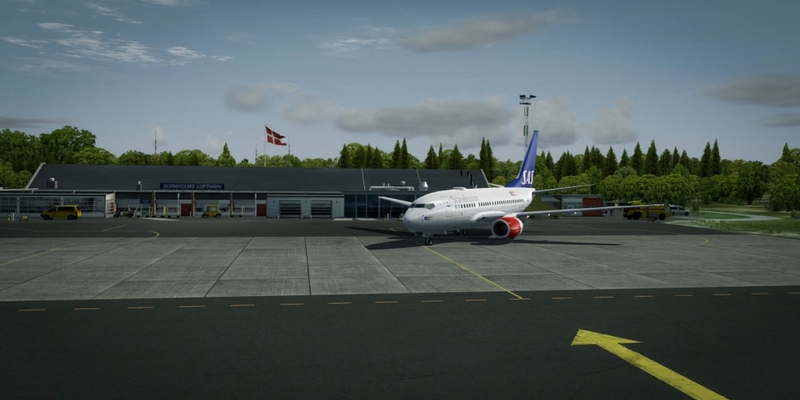 At the other extreme, among the planes visiting Bornholm, you will see 737-sized passenger planes (rarely). If you prefer bigger machines – the biggest that landed here was the Lockheed C-141 Starlifter of the U.S.A.F. In size, the four-engine military freighter resembles 767. From Bornholm, it flew to Gdańsk (Poland) carrying soldiers who took part in NATO exercises. Scenery shows a trace of the military too. In the port of Ronne, the developer moored an American destroyer and cruiser. Flying over the island, I recollect the stories of Baltops annual exercises in which such ships took part. Since I have already mentioned the port, it is worth looking at the town, which draws attention from a distance with its gabled roofs, covered with similar tiles. The buildings are low – often only the ground floor and an attic. As far as I know Danish architecture – the author (a Dane) must have made the textures based on photos taken in the country. Though repetitive – they give Ronne the charm of a small Danish town. Texture repeating in town is not a disadvantage here – we will admire them when departing or arriving at the nearby airport. Noise protection procedures apply – if we follow them, we will look at Ronne from an altitude of at least 2,000 feet. Besides the warships in the port, we also find more ships, fishing boats, and a crowded yacht marina. Bornholm is a popular port of call for yachtsmen from Germany, Poland, Denmark, and Sweden. Right next to the port, tourists will pay attention to the Church of St. Nicholas and a lighthouse – Rønne Fyr. This part of Ronne is most detailed – there are more real-world buildings of the waterfront of Rønne Lystbådehavn, and I recognize the characteristic barrel roof of the building with a corner bizarrely cut and the building with the Avis car rental office (although the rental itself is not marked in the scenery). Unfortunately, the hospital helicopter landing site has not drowned the developer‘s attention. Neither the hospital got any special treatment. It could use a custom model. 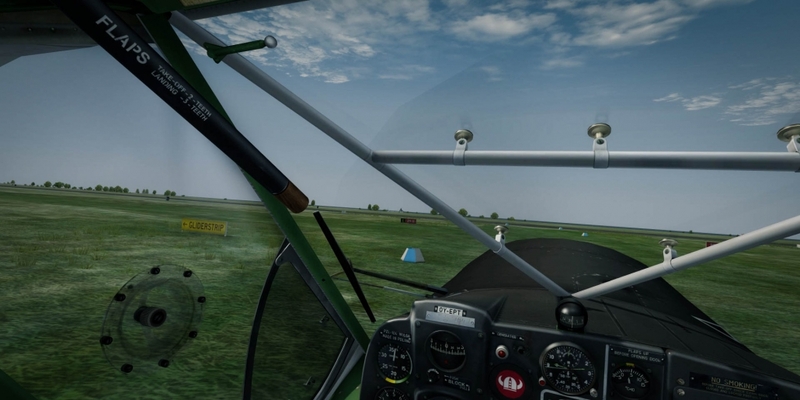 Still – it is a nice destination for helicopter pilots and the photoscenery includes the helipad. Going back to the airport, you may notice a large crater east of the city. They manufacture asphalt here. The depth of the hole is correct. Just below the final to runway 11, the developer placed a summer cottage colony. I am not convinced if such a location is the best place for a holiday. Runway 29 is the main for departures and you will have planes flying at low altitude at full engine power. But there are summer houses located exactly in this spot. And Vidan Design already has experience in such colonies – I remember a similar feature in other Vidan’s sceneries. These type of campings are popular in Denmark. 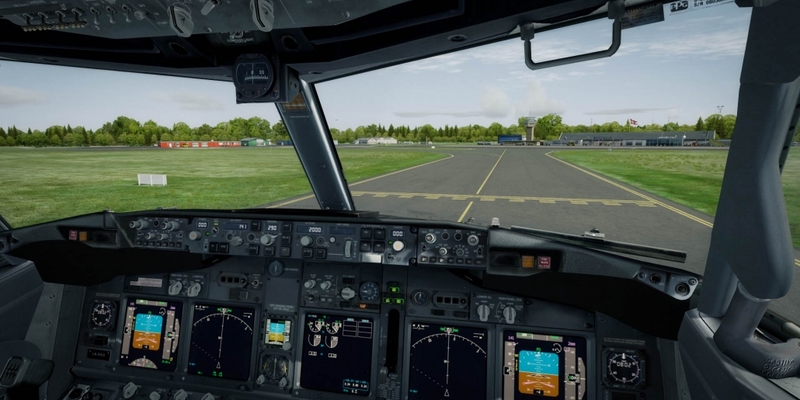 When landing, pay attention to the wider part of the runway near both thresholds. These are arresting gear positions. A typical solution for military airfields that makes operations of combat aircraft safer in case of broken brakes and aborted takeoffs. In Denmark they place these at all commercial airports – a remnant of the Cold War, during which Denmark would become a front-country if it ever turned hot. They dismantle cables for civilian operations. Otherwise, they would prevent small aircraft from landing. The cables (one at each end of the belt) is 7 centimeters thick and rubber discs keep it hanging a few centimeters above the runway. Just imagine front gear of a Cessna 172 catching such a cable. For military exercises, they mount the cables. All civilian aircraft require a special permit to land in such conditions. On the other side of the airport, the town of Arnager lies just under the final to runway 29. Noise protection procedures require departing aircraft to turn only after passing it. The arrangement of the town and the buildings appear very similar to those I saw in the pictures. A fishing boat drifts nearby at sea. I should say a few words about airport building textures. Especially when looking at the windows of airport buildings, it is obvious someone took photos and converted them to textures. I can even see the same person repeatedly reflecting in windows which suggests that the author took them or ordered them. This solution gives us realistic textures and interesting effects on windows. Reflection during the day and a peek into the insight of the buildings at night. These reflections may not quite agree with the conditions (we see the same reflection that the author saw, and we do not see, for example, our plane rolling towards the building). But I like this solution. It brings the real airport with all its details (like stickers on glass) instead of clean computer-generated textures. The night illumination of the airport is nice though not correct – the light on the apron does not fit the spotlights on the masts. This detail is not impairing the overall experience. Watch out for gulls flying above the airport. How typical for a seaside airport. Utility. I like sceneries to fit into the world of P3D. A small airport at the end of the world would be useless (how long can I fly patterns and short trips around the place?). This is the opposite of a small airport at the end of the world. I can use it with most of my planes (747 is the only exception among the planes I use). I can think of tens of routes to destinations that already have decent scenery. I can do flights in GA planes, I can do airliners. I can even fly an F-16 and it would not be out of place here. 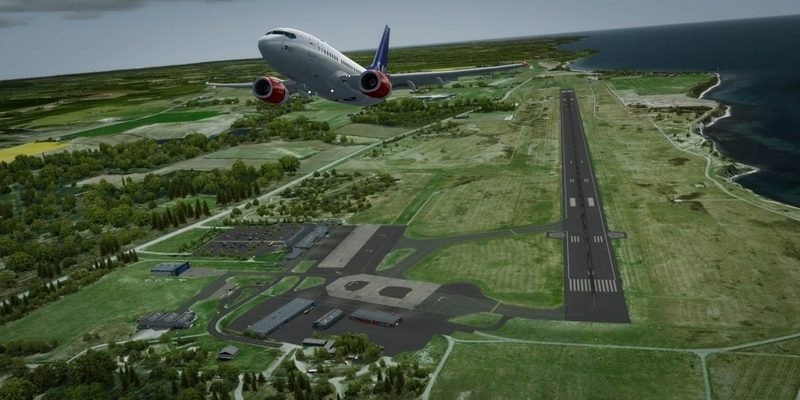 With Vidan Design other Danish airports (Billund Aalborg and small ones) and with the work of other developers (Copenhagen and lots of airports in Germany, Poland, Sweden) I can fly for months and not get bored. The scenery contains models and textures made for each season of the year. Not all switch according to the date in P3D (or FSX). 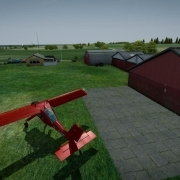 If you want to fly in winter, autumn or spring, use the configuration tool that will replace the textures (P3D / Vidan Design / Bornholm X / Manual). 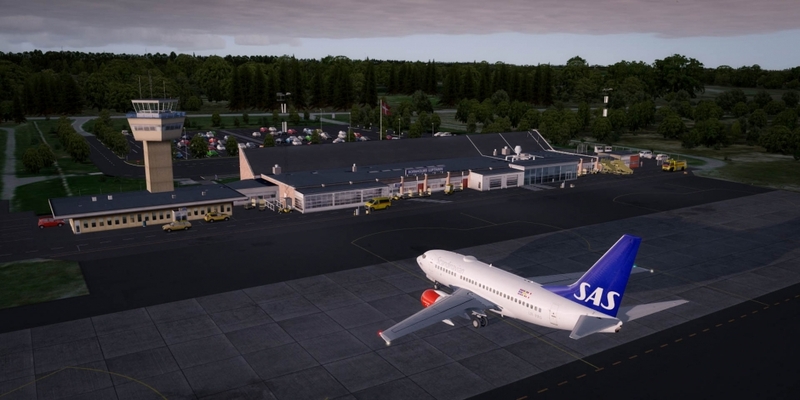 Since the product description does not contain a scenery coverage map, I must point out that the scenery includes the airport and the town of Ronne. The rest of the island will remain in the default setting. Global and openLC blend with Bornholm X.
I visited Bornholm even before a quality payware scenery of the airport appeared. With the scenery of Vidan Design, I visit it more often.